Tekken 7 (鉄拳7, Tekken 7?) is a fighting game developed and published by Bandai Namco Games as the ninth instalment in the Tekken series. The game is the first in the series to make use of the Unreal Engine. Tekken 7 had a limited arcade release in Japan on February 18, 2015, followed by another unfinished release on March 18, 2015. The game is still in beta stage. It is scheduled to be released for the PlayStation 4 and is also designed to be functional with the upcoming PlayStation VR system. An arcade update title, Tekken 7 Fated Retribution (鉄拳7フェイテドレトリビューション, Tekken 7 Feitedo Retoribyūshon?) was announced on December 12, 2015 and released on July 5, 2016. It features expanded content including new stages, costumes, items, and characters. Tekken 7 focuses on one-on-one battles. Two new mechanisms are introduced in the game. The first, "Rage Art", allows the player to execute several unblockable moves that deal roughly 30% damage depending on the character (the location test had several characters dealing up to 80% damage, but this was changed in the release version after feedback) once their health bar is critical, in exchange for deactivating the normal attack power increase. The second, "Power Crush", lets the player continue their attacks even while being hit by their opponent, although they would still receive the damage dealt by their opponent's attacks. The mechanic also works only for absorbing high or mid attacks. The bound system, which staggers a character to increase opportunity for additional hits, is replaced by "Screw Attack", which makes the opponent spin sideways when they are hit airborne, allowing the player to inflict additional hits after they reach the ground. Unlike the bound system, however, "Screw Attack" cannot be used to do wall combos. Thanks to a new display system, the game's multiplayer mode allows players to choose which side of the screen they want to play on. Movement has undergone some changes and now is similar to the movement mechanics found in Tekken Revolution, most notably when characters walk backwards. The arcade version features the traditional stage-based playthrough, in which the player progresses by beating five different opponents one by one, ending with a fixed penultimate and final stage. Matches may be interrupted if another player joins the game. Online mode is available for both local and international play. Character customization is featured, allowing the player to modify characters' appearances. For the first time in the arcade version of a Tekken game, the game features a practice mode, which allows players to train moves against an opponent for a limited amount of time, as well as an option to collect in-game rewards, mainly customization items, through "Treasure Box" by winning enough matches. The game's producer Katsuhiro Harada said that the game's story will be much darker than ever before, closer in tone to Tekken 4 and will serve as the conclusion of the Mishima clan saga. It will provide answers regarding the feud between Heihachi Mishima, his son, Kazuya Mishima, and his grandson, Jin Kazama, including the origins of Devil Gene among other Tekken mysteries. 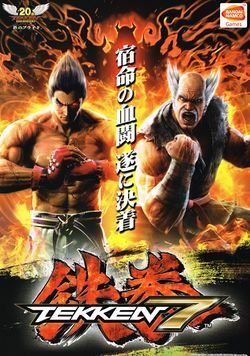 A trailer released in July 2014 introduced the backstory regarding Heihachi's wife, Kazumi Mishima, who was killed by him years prior to the events of the earlier games. This page was last edited on 17 November 2016, at 05:16.